From your Paper Settings Dashboard, click Web Newspaper, then Layout & appearance, then Look & feel, then Color scheme to view your color settings. Choose one of the standard color schemes or pick a custom color using the custom color picker. From your Paper Settings Dashboard, click Layout & appearance, then Look & feel, then Font scheme to view your font settings. 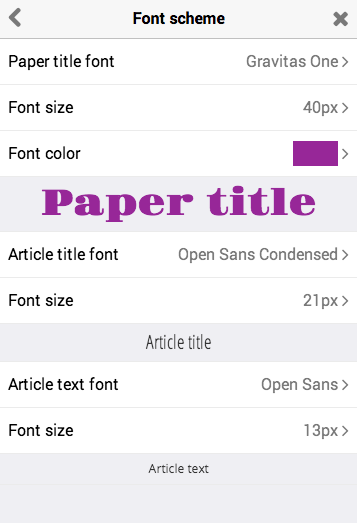 You can change the font size and color for your Paper title, the font and size for the Article title and text. Using the Paper.li News Page App on your WIX site? All layout and color controls are found by accessing your WIX page settings. Click anywhere on the body of your Newspaper to see Settings button, shown below. From there, you can edit the text color, choose a font, and choose a general color scheme. Want to know how to white label your paper and further modify the look and feel of your paper using CSS? Learn more about what you can do with our knock-out $9/month Pro Plan. Go PRO!